WINSTON-SALEM, N.C. – Bill Erickson, the owner of BE Shoes, and Rob Simon of Windsor Jewelers met with other local business owners about the need to educate the public on the importance of supporting local businesses. The premise is that that local businesses not only employ local citizens but they are the businesses that pay local taxes and support local charities. 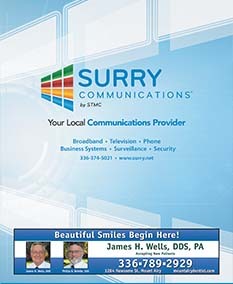 Surry Communications (STMC) immediately saw the value of the campaign and signed on to lead local efforts. Melanie Senter, Marketing Manager of STMC says, “We are locally owned. We employ local people. We support local non- profit organizations in the community. We think it is important to support locally owned companies. One study shows that for every $100 you spend at locally owned businesses, $68 will stay in the community vs. $43 when you buy from a national chain (independentwestand.org)”. “I shop online like a lot of people do,” Rob Simon of Windsor Jewelers said. “But it’s a very different experience when you can walk into a local shop to touch and see what you’re considering to purchase. Local retailers have knowledge and advice regarding products and services that online sources just can’t provide and local businesses support our communities and non-profits. Nearly two dozen businesses have signed on to be part of Buy Local, but additional businesses can be added throughout the duration of the campaign. Businesses in the Buy Local campaign receive a door/window decal and are being featured in a series of commercials televised on WXII. Nearly two dozen businesses have signed on to be part of Buy Local, but additional businesses can be added throughout the duration of the campaign.